Gloria Amadeo an author, a bilingual motivational speaker --to name a few-- is one of the brightest and most respected businesswomen in the industry. She is also founder and President of Amadeo Entertainment. A professional, kind and gentle lady --who never skips a beat-- demonstrating devotion to helping women achieve their potential within the Entertainment Industry. An executive member of Women In Film, Gloria is most proud to continue support. 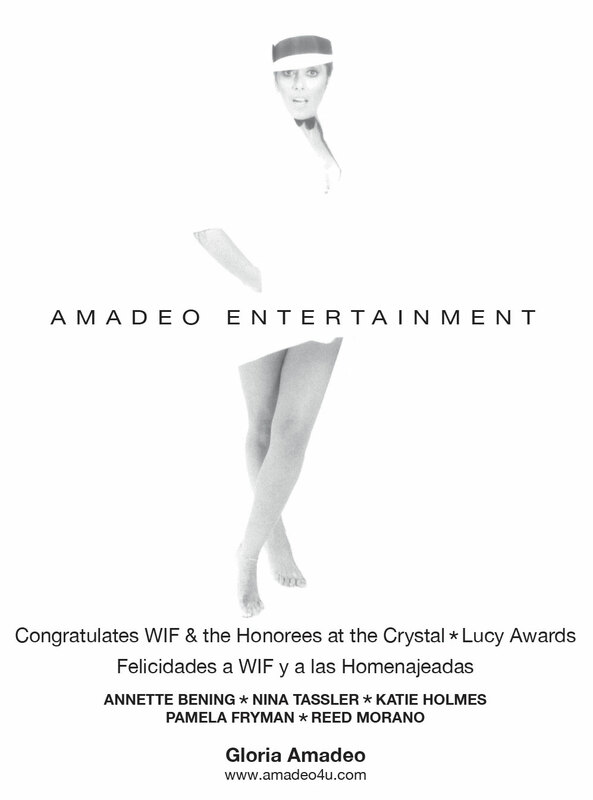 Most recent, the Honorees at the 2011 Crystal + Lucy Awards: ANNETTE BENING, NINA TASSLER, KATIE HOLMES, PAMELA FRYMAN, and REED MORANO. For her dynamic contributions and leadership in AIDS research, Elizabeth Taylor was awarded the Norma Zarky Award. ANNETTE BENING-2011 Crystal Award for Excellence in Film. KATIE HOLMES-Women In Film Max Mara “Face of the Future®” 2011. NINA TASSLER-2011 Lucy Award for Excellence in Television. PAMELA FRYMAN-2011 Dorothy Arzner Directors Award®. REED MORANO-2011 Kodak Vision Award. DAME ELIZABETH TAYLOR-2011 Norma Zarky Humanitarian Award®.